There are power lunches, power ties and now… power parking meter kiosks! Parking my truck curbside at the Gold Street Café, in downtown Albuquerque, I grabbed some change for the parking kiosk (you know the rectangular structures that are replacing the classic Duncan Parking Meters). Walking towards the kiosk I recognize the person who appears to be getting a fight from the machine. “It won’t read my card, we are looking for change,” he says. Adjacent to kiosk is an SUV with an unidentified person leaning into the vehicle appearing to be looking for change (you know the stance with both feet on the curb). The person I know looks to me and asks “you got a nickel?” I said “sure thing.” About that time, the unidentified person looking for change emerges from the passenger side. It is none other than Richard Berry, the Mayor of Albuquerque! I’ve been a fan of Mayor Berry since his days as a State Representative. Today, he reinforced his already high standing. 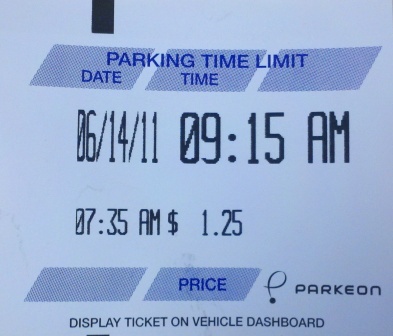 After all, how many Mayors will spend time looking for spare change to feed their own city parking kiosk?